The object detector described below has been initially proposed by Paul Viola [Viola01] and improved by Rainer Lienhart [Lienhart02]. First, a classifier (namely a cascade of boosted classifiers working with haar-like features) is trained with a few hundred sample views of a particular object (i.e., a face or a car), called positive examples, that are scaled to the same size (say, 20x20), and negative examples - arbitrary images of the same size. After a classifier is trained, it can be applied to a region of interest (of the same size as used during the training) in an input image. The classifier outputs a “1” if the region is likely to show the object (i.e., face/car), and “0” otherwise. To search for the object in the whole image one can move the search window across the image and check every location using the classifier. The classifier is designed so that it can be easily “resized” in order to be able to find the objects of interest at different sizes, which is more efficient than resizing the image itself. So, to find an object of an unknown size in the image the scan procedure should be done several times at different scales. The feature used in a particular classifier is specified by its shape (1a, 2b etc. ), position within the region of interest and the scale (this scale is not the same as the scale used at the detection stage, though these two scales are multiplied). For example, in the case of the third line feature (2c) the response is calculated as the difference between the sum of image pixels under the rectangle covering the whole feature (including the two white stripes and the black stripe in the middle) and the sum of the image pixels under the black stripe multiplied by 3 in order to compensate for the differences in the size of areas. The sums of pixel values over a rectangular regions are calculated rapidly using integral images (see below and the integral() description). The following reference is for the detection part only. There is a separate application called opencv_traincascade that can train a cascade of boosted classifiers from a set of samples. In the new C++ interface it is also possible to use LBP (local binary pattern) features in addition to Haar-like features. Base class for computing feature values in cascade classifiers. Reads parameters of features from the FileStorage node. node – File node from which the feature parameters are read. Returns a full copy of the feature evaluator. Returns the feature type (HAAR or LBP for now). Assigns an image to feature evaluator. img – Matrix of the type CV_8UC1 containing an image where the features are computed. origWinSize – Size of training images. The method assigns an image, where the features will be computed, to the feature evaluator. Assigns a window in the current image where the features will be computed. p – Upper left point of the window where the features are computed. Size of the window is equal to the size of training images. Computes the value of an ordered (numerical) feature. featureIdx – Index of the feature whose value is computed. The function returns the computed value of an ordered feature. Computes the value of a categorical feature. The function returns the computed label of a categorical feature, which is the value from [0,... (number of categories - 1)]. 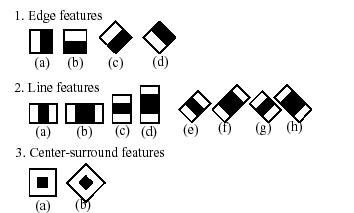 type – Type of features evaluated by cascade (HAAR or LBP for now). filename – Name of the file from which the classifier is loaded. filename – Name of the file from which the classifier is loaded. The file may contain an old HAAR classifier trained by the haartraining application or a new cascade classifier trained by the traincascade application. cascade – Haar classifier cascade (OpenCV 1.x API only). It can be loaded from XML or YAML file using Load(). When the cascade is not needed anymore, release it using cvReleaseHaarClassifierCascade(&cascade). image – Matrix of the type CV_8U containing an image where objects are detected. objects – Vector of rectangles where each rectangle contains the detected object. Sets an image for detection. cascade – Haar classifier cascade (OpenCV 1.x API only). See CascadeClassifier::detectMultiScale() for more information. feval – Pointer to the feature evaluator used for computing features. image – Matrix of the type CV_8UC1 containing an image where the features are computed. The function is automatically called by CascadeClassifier::detectMultiScale() at every image scale. But if you want to test various locations manually using CascadeClassifier::runAt(), you need to call the function before, so that the integral images are computed. in the old API you need to supply integral images (that can be obtained using Integral()) instead of the original image. Runs the detector at the specified point. feval – Feature evaluator used for computing features. pt – Upper left point of the window where the features are computed. Size of the window is equal to the size of training images. The function returns 1 if the cascade classifier detects an object in the given location. Otherwise, it returns negated index of the stage at which the candidate has been rejected. Use CascadeClassifier::setImage() to set the image for the detector to work with. groupThreshold – Minimum possible number of rectangles minus 1. The threshold is used in a group of rectangles to retain it. eps – Relative difference between sides of the rectangles to merge them into a group. The function is a wrapper for the generic function partition() . It clusters all the input rectangles using the rectangle equivalence criteria that combines rectangles with similar sizes and similar locations. The similarity is defined by eps. When eps=0 , no clustering is done at all. If , all the rectangles are put in one cluster. Then, the small clusters containing less than or equal to groupThreshold rectangles are rejected. In each other cluster, the average rectangle is computed and put into the output rectangle list. © Copyright 2011-2014, opencv dev team. Last updated on Dec 16, 2016. Created using Sphinx 1.3.6.